During the Exo Terra expedition to Madagascar in 2004, a new species of the genus Phelsuma was discovered. This totally new and isolated species, was discovered by Exo Terra manager Emmanuel Van Heygen an d also named after him: Phelsuma vanheygeni. It was found in the Bamboo forests on the Ampasindava peninsula in North Western Madagascar. Phelsuma vanheygeni is a small species and reaches an overall maximum length of only 80 mm. Its dorsal coloration including head and tail is vivid green bordered by a yellowish lateral line. The ventral coloration is dirty white. This new species shares its habitat, patches of bamboo forests, with Phelsuma madagascariensis grandis, P. klemmeri and P. seippi. The juveniles of this new species are yellowish-brown and colour gradually green growing up. As during their Madagascar 2004 expedition, the Exo Terra team discovered a totally new gecko species deep in the rain forest of central Gabon during their expedition to that country in the spring of 2007. The new tiny day gecko was spotted by team leader, and Exo Terra manager, Emmanuel Van Heygen. It took a team effort though to capture the tiny gecko for documenting, measuring and photographing. It is certain that this species is extremely rare, since only two specimens were found during very intense searches in the forests surrounding Langoue Bai in Ivindo National Parc . 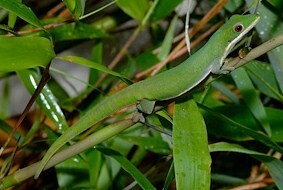 The gecko, a member of the genus Lygodactylus, lives on vast networks of lianas close to the forest floor. When disturbed, or when sensing danger, these geckos immediately hit the leaf litter for cover. This makes it almost impossible to monitor, let alone capture them. Their size (only 70 mm), colour and speed make them even more elusive. The gecko will be described in Olivier Pauwels next book on the reptiles of Gabon. Mr. Pauwels is a Belgian herpetologist and has worked as a WWF consultant in Gabon. Currently he is the Smithsonian Institution’s country manager for Gabon. A third discovery of a new reptile species was made during an Exo Terra expedition. 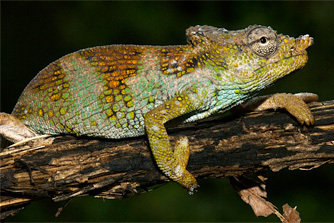 The latest expedition to Southern Tanzania revealed totally new Chameleon species to science! The animal was discovered near the Ngozi Crater in the Poroto Mountains. The species was named after Exo Terra manager Emmanuel Van Heygen and described in the German herpetological journal "Sauria" by Petr Nečas.